Thank you for considering donating to a wonderful cause and supporting our troops overseas. My name is Janice, some of you know me as the lady who wrote The Story of Bruce. Others of you don’t know me at all, and let’s just say you’re missing out, but I digress. I am facilitating this shindig so I wanted to tell you a little about me and about this cause. As for me, there’s a few things that I believe very strongly in, which are, good food, good friends, a good beer, and helping others. 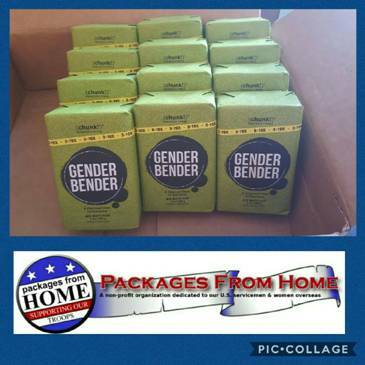 Packages from Home (https://www.packagesfromhome.org/) is a 501(c)(3) organization that raises funds, and garners items to ship to deployed military members stationed overseas. We all understand that being deployed is not easy, but to make matters worse our service members are often away from the daily comforts we all likely take for granted such as soap, shaving cream, and good beer. While we can’t ship beer overseas, we can work together to ship a few of the other things to help out. These packages actually mean much more to our service members. One service member said that receiving familiar items not only provided the comforts of home that he missed so much, but also reminded him that someone was thinking of him, which helped him combat the loneliness and dangers of deployed life. Receiving the packages motivated him to fight for his country and come home safe to his friends and family. So, with the help of Ryan Kaper, I have facilitated this beer raffle in hopes that we can raise some funds to put towards purchasing some needed items for our service members. All proceeds will go to this cause. I’ve also organized some comic books to be included in the packages to go out as well! Once we have collected the money I will order the items and can provide a receipt for proof of purchase. Packages from Home is local to me so I will be able to bring all the items to the facility for drop off. Below are some items we will be using to purchase for our service members as well as some information on how to add your service members address to the list to receive a care package. Soap containing charcoal for an extra clean feel, and a shave gel. These items are naturally based and high quality products, so I’m not just sending them a bar of Irish Spring. If you have any other questions please feel free to reach out to myself or Ryan Kaper on Facebook. Natural shea butter and palm oil soothe and moisturize your skin with a crisp fragrance. Lather into hands and clean from head to toe, then rinse thoroughly. This Chunk is perfect for everyone. Aloe vera and botanical extracts soothe, moisturize, and protect your skin to take you from hairy beast to smooth and suave. Place a quarter-sized dollop of shave gel in hands. Lather with water and smooth over skin. Shave, rinse well, and follow with Calm the Beast Aftershave. Go on, show your beard who’s boss. If you have a service member that you would like to benefit from this cause you can sign them up for free with Packages from Home!